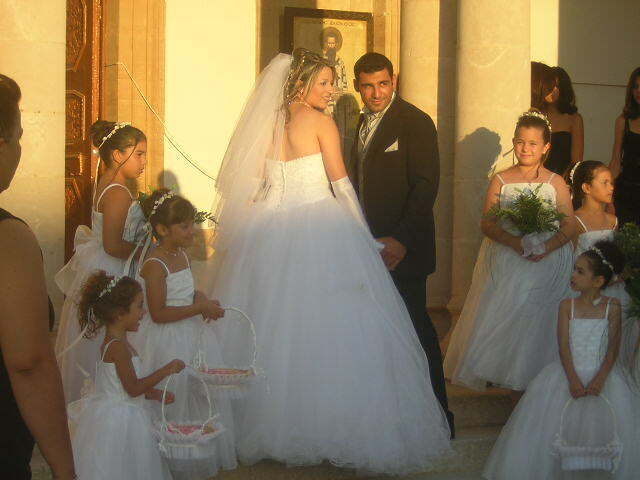 This is a picture of my cousin Phoulla and her husband Andreas on their wedding day on July 12, 2003. This was taken in Cyprus in front of the Greek Orthodox Church of Apostolos Petros and Pavlos (Apostles Peter and Paul) in Avgorou, Cyprus. The picture above may look similar to pictures that you may see from many American weddings, but the preparation and ceremony are very different. For example, the song playing right now is a traditional Greek-Cypriot wedding song that is played live with a violin and a laouto(like a guitar) as the bride is preparing for her departure to the church. The websites listed below may help you better understand the Greek-Cypriot culture and its traditions.